Gold Coast Tiger Bay Club, After Hours “Meet and Greet” Getting to Know US. 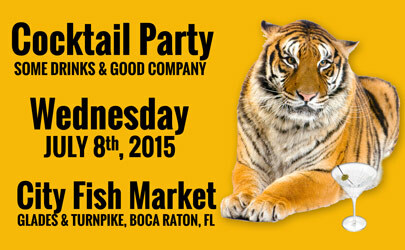 of “Gold Coast Tiger Bay Club” at The City Fish Market, Glades Road in Boca Raton. 5-7 PM Cocktails and finger foods, Admission is FREE, but we ask that you please RSVP using the form below. Learn about our non-partisan political group and how you might benefit by becoming a member or sponsor.